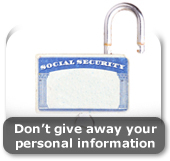 Many of us don’t think that we would ever fall for a social security fraud but it happens all the time. Many people don’t even know that they have been taken by a scammer until it is too late. You can protect yourself from being scammed by knowing some of the more common social security scams that are out there and just waiting for a new victim to come along. Educate yourself about how the social security system works. When you do this you will be less likely to fall for the scammer’s tactics. One of the most common social security scams involves someone receiving a letter in the mail stating that someone in the home needs a new social security card. The letter says that all that needs to be done is to fill out a form and send in a filing fee. The person in the house will assume that the letter is legit because it often has official looking letterhead and the wording is all very persuasive. The result is that the person will send payment or send in credit card information. In some cases the individual doing the scamming will just take the money and in other cases the information that is provided via the filing form will actually be stolen and used to open credit card accounts. Another one of the more common social security frauds is one that tells a recipient of checks that they are eligible to receive an addition check. To get the check there is just a one time filing fee and you need to fill out and return a form. The person who receives the letter will often do just that, and the information and the money will fall into the hands of a scammer. Many times the scammer just wants the filing fee, but in other instances the information sought on the filing form will actually be used to clean out bank accounts, open credit card accounts, and generally just ruin the person’s credit through fraudulent activity. In another of the more recent social security scams a lot of people were called and told that they were being contacted by the social security administration because they were required to get a new social security card. They were told that there was a one time fee for this and that all they needed was their social security number and a bank account number or a credit card number. Many trusting consumers actually believed that the social security administration was requiring them to get a new card and they handed over all of their personal information to the scammers. Do not fall for this scam as it will only lead to heart break and headaches. If you do fall for the scam than you should immediately call your bank and credit card companies and have them freeze the accounts. There are many social security scams in which tax preparers take advantage of those who collect social security. The preparer will tell the individual that they need three years worth of statements to prepare their tax documents. With this information they will create a faulty return that will allow them to collect a refund for the individual that is higher than it should be. The preparer will take a portion of the refund as payment, and then they’ll often disappear. When the IRS realizes what has happened the person on social security has to pay the money back in addition to any fines and interest, despite the fact that they did not prepare the taxes. It is also a scam to collect the social security checks of another individual. Many people fail to report to the social security administration that their loved one has passed away. Instead, they continue to collect on the person’s social security income for months until the government realizes that the person is deceased. If you or someone that you know has justified accepting and cashing these checks, you need to stop and notify the social security administration. The only person authorized to receive and permit the cashing of those checks is the person to whom they are issued. If they are deceased the checks in their names should not be cashed. I have just been informed that the woman who is taking care of my mother here in Minnesota, is guilty of social security fraud she allegedly committed in California. Is it possable to find out if this is true. If so, how? I was told she lied to social security and ssi about her household income and neglected to tell them her husband was living with her. I was told she has to repay about $15,000. back to the social security system. Direct all your queries to me via email or you can as well call me directly on any of these lines: +44701-112-8761 and +44701-112-0785. please tell is it fraud. hi anurag this is a fraud itoo have the same offer they will ask u money for geeting a security no thats it they are jerks they cheat.dont fall for them. hi this is ajay here me to meet with this kind of people,first they send me an offer letter by mail and tearms emploment letter and then they told me to send money, first they told to send GBP770, and second they told me to send GBP1453,I did not think about it an paid the money by seeing the offer letter, after paying this to they did not do any think,i lost my money, so now what should i do………..
Hi there. I was reading your post on Welfare Fraud but unfortunately comments are closed so I’m commenting here. Perhaps you could update your article to reflect this?